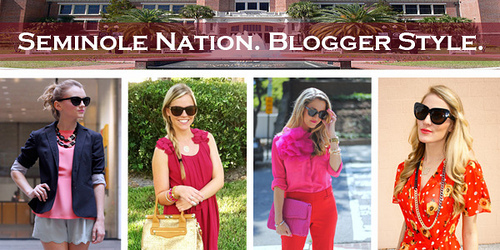 For round 4 of the Seminole Nation: Blogger Style post I decided to go with a look that's chic, but doesn't scream "garnet and gold." Sometimes you want to wear a great outfit for gameday, but you don't want to be covered in your school colors or mascot. You know, kind of like when our football team wears white uniforms for away games. It's nice to switch it up and wear whites or creams -- even blacks (FSU just loves their black-out games!)! 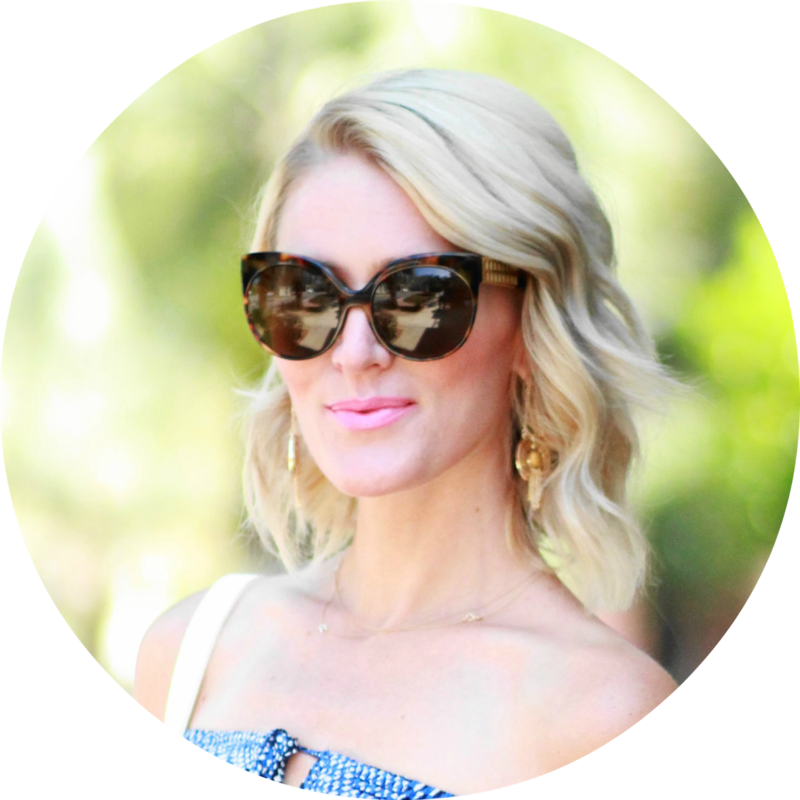 This sheer top not only kept me cool in the 80 degree FL heat, but was the perfect option for my growing belly bump -- and for my fab vintage Christian Dior belt that I haven't worn on the blog in forever. 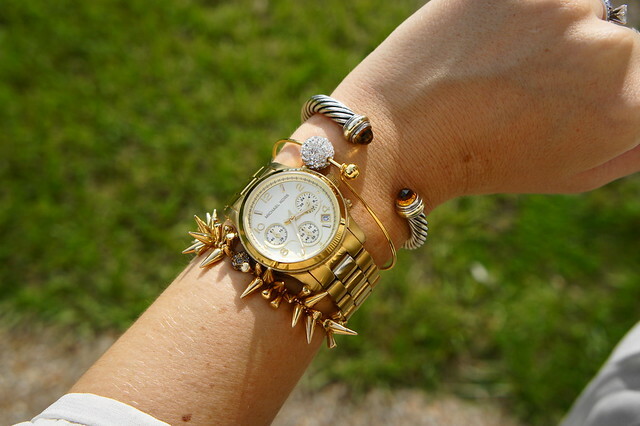 I couldn't resist touches of gold in my acessories -- how rad is the spiked cuff I'm wearing? And, a Seminole Nation outfit post couldn't be complete without a touch of garnet, so I wore one of my fave burgundy shades of lipstick (Maybelline "Plum Jewel") and rocked these really funny FSU sunglasses by Miss Fanatic. Wow, such a fabulous and stylish outfit! That blouse is so cute on you!! First of all, so jealous that you are having such warm weather! But what a perfect look for a warmer day that is still super chic, love that skirt! This may be my favorite gameday outfit of your's yet! SO freakin cute! I am utterly charmed by this look. You make pregnant so stylist! This outfit is amazing! 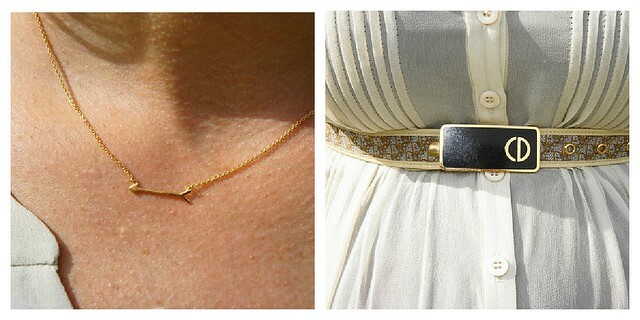 You have the BEST pregnancy style ever! A gorgeous mother to be! You look amazing ! Love those boots and that skirt too !